Gil (left), Gina, and Mark. 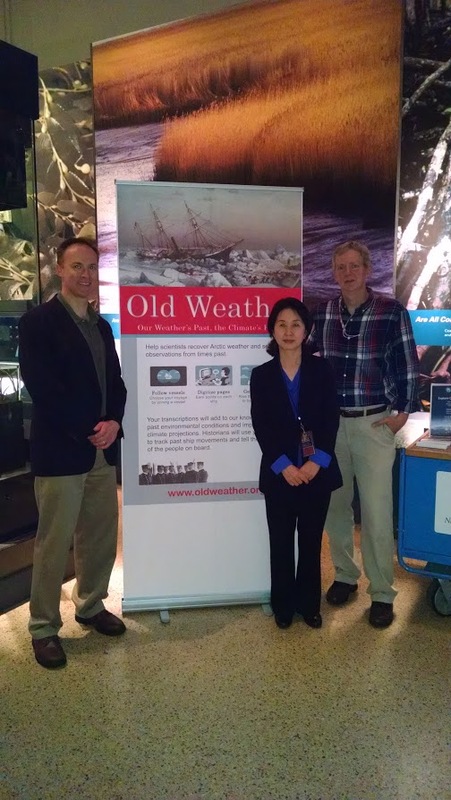 Our representatives at last weekend’s Smithsonian Arctic Spring Festival had a busy and succesful time: On Friday they welcomed 375 visitors, and on Saturday 710; including people not only from around the U.S, but also from Australia, India, Poland, Russia, and Korea. 710 people over a daily stint (10:00 am to 4:00 pm) averages at two people every minute for the whole six hours. Even though the visitors mostly came in groups and couples, that’s still a lot of talking – it’s hard work, even for a fun event. But of course we have plenty of enthusiasm and a lot to talk about, and with Mark, Gina and Gil all present we had experts covering the whole sweep of the project, from the original records at NARA, through the logbook imaging and organisation, to the climate reanalysis outputs.